As plans were being finalized for the trip to Haiti, word began to get out of the crew’s journey ahead. Everyone was excited and motivated, and having the press covering their story was still new and exhilarating for my dad, Greg Brooks, and the rest of his crew. As preparations were being made, two days before they were due to set sail to Haiti, a man showed up on the R/V Silver Seas. He was dressed in a dark suit and no one recognized him. He gave my dad a slip of paper with a telephone number on it, and told him to call this number before he went to Haiti. Curious, my dad called the number right after the man left. It turned out that the number was straight from Washington DC, and the governmental official that answered explained to my father that under no circumstances was he or his crew to go to Haiti that week. My dad was very confused and no one was offering any reasons or explanations. He asked what would happen if they did show up in Haiti, and the governmental official told him it was likely he would not be allowed back into the US if that happened. My dad was determined, however. He had spent the last decade dreaming of the treasures that were laying below the clear blue waters of Haiti. After two trips and a lot of research, he couldn’t give up now. Since no clear answers were being laid out by the government, he continued on. The crew left for Haiti as planned in September 1994. When they got there, it became obvious why the government didn’t want the R/V Silver Seas anywhere near Haiti. They had arrived right at the beginning of Operation Uphold Democracy, where dozens of U.S. military ships were patrolling the oceans around Haiti and numerous American officers were all over the country. The goal of this mission was to end the Haitian military regime that had overthrown President Aristide three years before. Arriving in the middle of this was a shock to my dad and the rest of the crew, but things worked out in their favor. 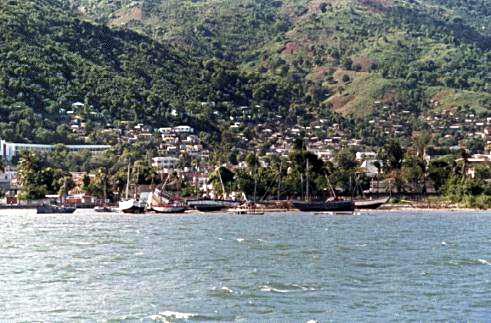 In the midst of all the commotion, no one even questioned their presence in the Cap-Haïtien Harbor (see above photo – the ship’s view from the Haitian harbor). In fact, it was assumed by the military that the R/V Silver Seas was an undercover CIA ship! Because of this, my dad and his crew were allowed to dock in the bay and were even given special provisions. This trip didn’t yield any silver bars for the crew, but they did get to explore the “Porcelain Wreck”. With the help of a resort owner named Jean-Claude Ditmar, they found a wreck off the coast of Haiti that was loaded with beautiful blue-patterned white porcelain dinnerware. This wreck was believed to be the remains of a French ship, likely from the 17th or 18th century. My dad was able to keep a small number of plates and teacups, which he ended up putting on display in his office once he (successfully, I might add!) returned to Maine.